Erin Shriver has evolved her covetable fine art into opulent textiles for her luxury island lifestyle brand. “I make art because I like to talk to people, but don't usually know how to start the conversation," says Sarasota-based artist and textile designer Erin Shriver. For her, fine art became an outlet to process various social concepts—opens a dialogue on topics that range from comforting to humorous. 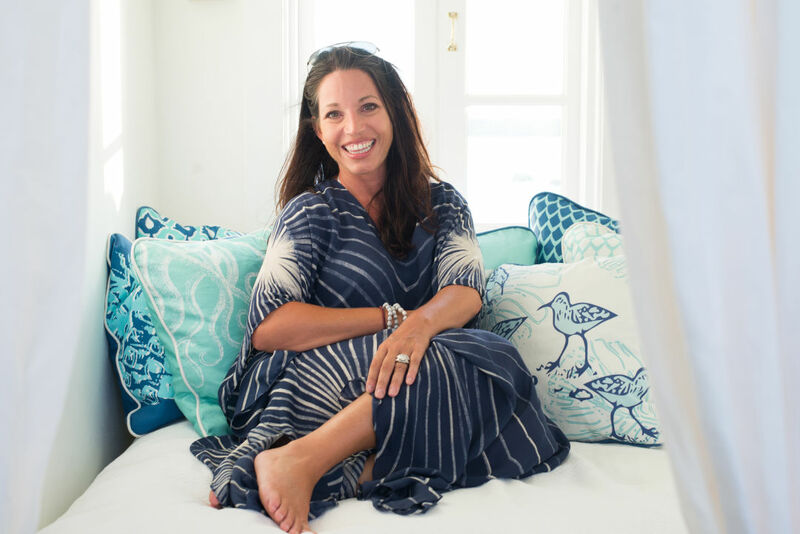 Evolving from fine art, Shriver became obsessed with surface patterns and fabric, which led to the launch of her luxury island lifestyle brand Indigo Palm. She transforms her artwork into something tangible for others to enjoy through various mediums—from watercolors to silk dyes. In fact, her designs are often crafted directly onto fabrics, creating an original textile that can be transformed into dreamy resort wear or charming pillows. The goal? To create unique, small-run, limited-edition, well-made clothing and accessories. Here, get to know the talented, accomplished Shriver and find more about Indigo Palm. When building Indigo Palm, what was most important to you? That it reflects the lifestyle that we’ve grown to love at our house at Kamalame Cay, Bahamas. We have been visiting Kamalame for nearly 20 years and like Indigo Palm, it has an interesting mix of comfort blended with luxury. I don’t make any decisions about creating new products unless I feel that the garment, art, or interior textiles would fit seamlessly into island life on the Cay. How would you describe Indigo Palm to those who are new to the brand? Two words: barefoot chic. For example, our classic white kaftan easily takes you from a poolside party or beach barbecue to the dining room for champagne cocktails. It’s all about the ease of island living and being able to move freely yet graciously. My art and prints reflect the same eclectic, relaxed vibe—Robinson Crusoe meets Palm Beach. How did you take up textile design? I think it took me up! I started off around 15 years ago, hand-dyeing silk sarongs for [my] boutique at Kamalame Cay. I never really thought of pursuing art as a career until we moved to Sarasota just over four years ago. I had an opportunity to essentially start over and my husband, Beaver Shriver, had a big hand in the decision to explore textiles further. I began creating patterns and needed a vehicle for showcasing them, which is when I decided that resort wear would be a great way to highlight my art. I still make a limited number of hand-dyed silk pieces, but keeping up with demand led me to also explore screen-printing yardage and digital printing. Today, I use a variety of methods to create both fashion textiles as well as home decor designs. In fact, I’ve ended up with so much extra art that I started creating patterns that go into a licensing portfolio on my website. 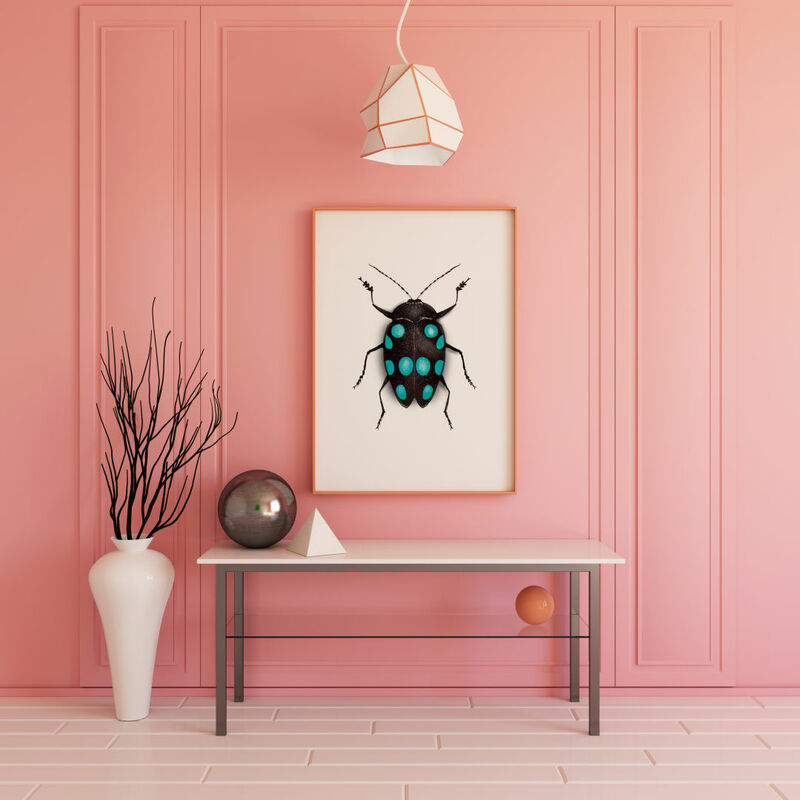 In addition to creating art and patterns for Indigo Palm, I have also started a mini surface pattern design studio where I sell or license my work to other companies. It’s a fascinating industry, and I can’t go anywhere these days without seeing patterns. Patterns are absolutely everywhere. I think our classic white caftan will always be my favorite. It’s a staple piece for me when I travel to the islands. It’s also the piece most in demand, and was recently used in an international advertising campaign to promote Bahamas tourism. It was really fun to wake up one morning to a photo that a friend posted on Instagram of my caftan on the side of a cab in London! I sold out of everything last year, which has been a really great problem to have. This year I started production for additional styles of caftans, as well as kimonos in various Indigo Palm bespoke prints. I’m excited about what 2018 will bring as I continue to expand the offering of resort wear, accessories and soft goods for the home. We are thrilled to start offering wholesale accounts in 2018 as well. As of right now we have been picked up by four hotels and boutiques in Florida and the Caribbean, and hopefully we will find a great home in Sarasota for the new resort wear line, too. As for the home decor aspect, I have a few select designs that will be launched soon on oversized throw pillows trimmed in jute, as well as some spectacular upholstery designs that are being used to update vintage chairs that I picked up locally. How cool of you to design and produce a scarf to benefit the Child Protection Center. I heard it’s launching at the Men, Whiskey and Watches event in December. Tell us a little bit about the piece. I approached Mya Widmeyer and Dan Starostecki about creating a scarf for the Child Protection Center after my husband and I toured the facility a few months ago. 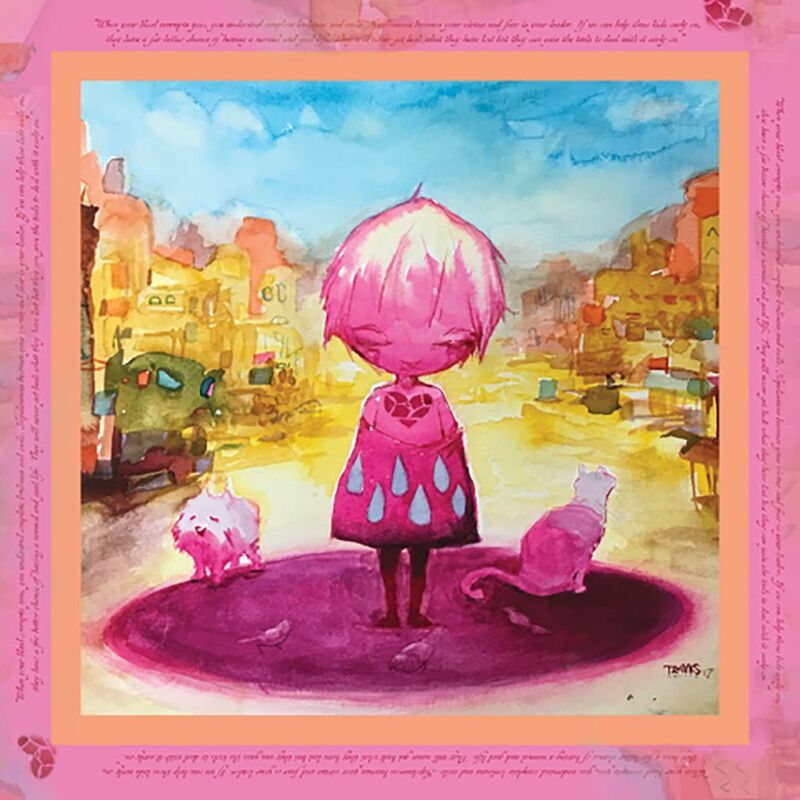 Together, we contacted Travis Franklin of Oddity Tattoo to create art for the scarf, as we wanted to be sure that the artwork had personal integrity related to the cause. Once Travis created the painting, I did my part by laying out the design, creating the borders and adding a quote by Travis that borders the scarf. It turned out beautifully. After receiving several strike-offs from my mill, we decided on a 100% silk crepe de chine fabric with a classic hand-rolled edge. One hundred percent of the proceeds will go to the Child Protection Center of Sarasota. The scarves are available on the Indigo Palm website for pre-sale, and will be in stock in time for the holidays this year. It’s been such an honor to work on this project; I’m very excited to help create an annual collectible scarf for CPC to raise much needed funds for years to come. Lastly, what would our readers be surprised to know about Indigo Palm? 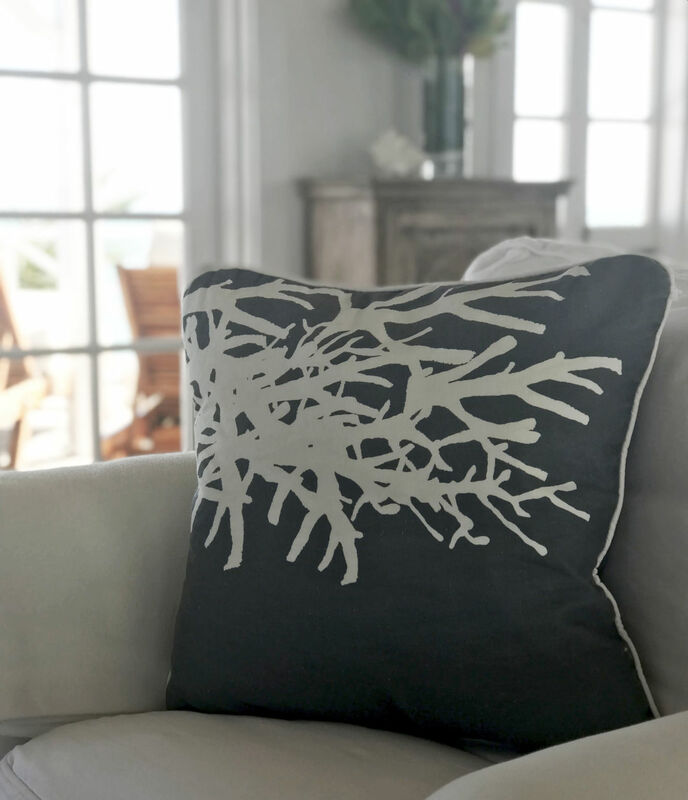 I’d say one of the most exciting developments is that we are producing all of our new resort wear items and soft home goods right here in the Sarasota/Bradenton area. I like to keep things local when I can, and was thrilled after years of searching to have discovered several Florida factories that I can work with. Other than that, I wouldn’t want to leave out that I also work with individuals to create custom textiles for their homes and businesses. I really love these projects and working one-on-one with clients.